In my ongoing World Borders series this time I report on how to get from Bulgaria to Macedonia. 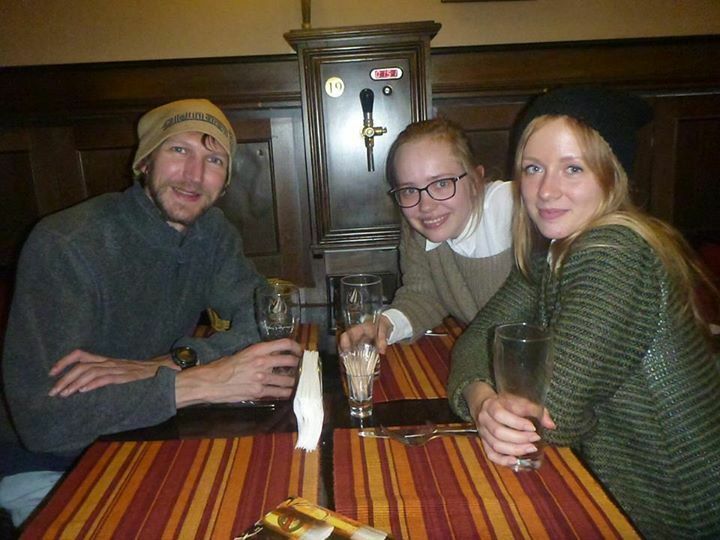 I based myself in the capital city of Sofia just before heading across the border – you should aim to stay in the 10 Coins Hostel there – one of my favourite ever hostels. From Sofia, I decided to take the bus across the border all the way to Skopje, Macedonia (or the Former Yugoslav Republic of Macedonia to give the country its full title). Head on the Sofia Metro (fast, efficient, clean, easy to understand and cheap) to the main bus station which is also where the main train station is. The name of the bus station is Central Bus Station, but don’t go inside! Please note there are two bus stations beside each other here. 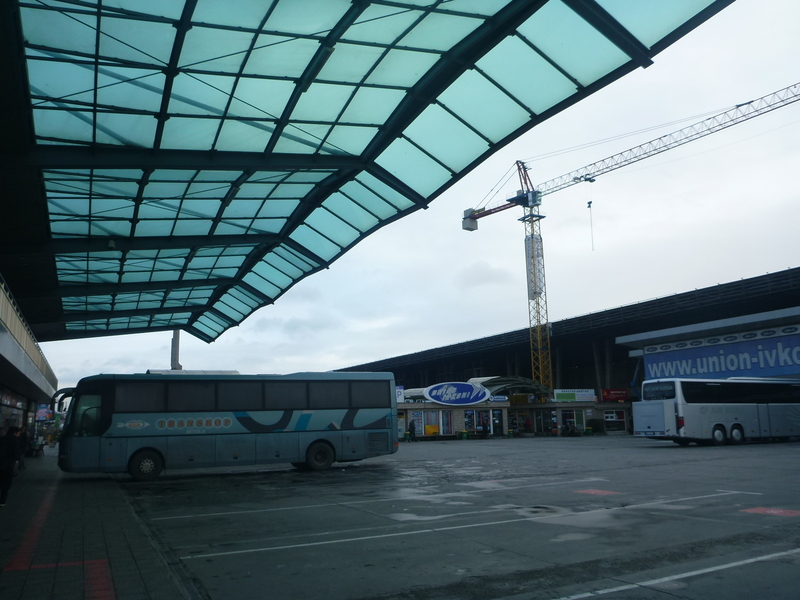 I firstly went into the massive indoor one pictured above and asked around for buses to Skopje, Macedonia to no avail. So you need to come outside of the main station and cross the road to the smaller outdoor station in like a square courtyard with the buses in the middle and the ticket offices all around it. 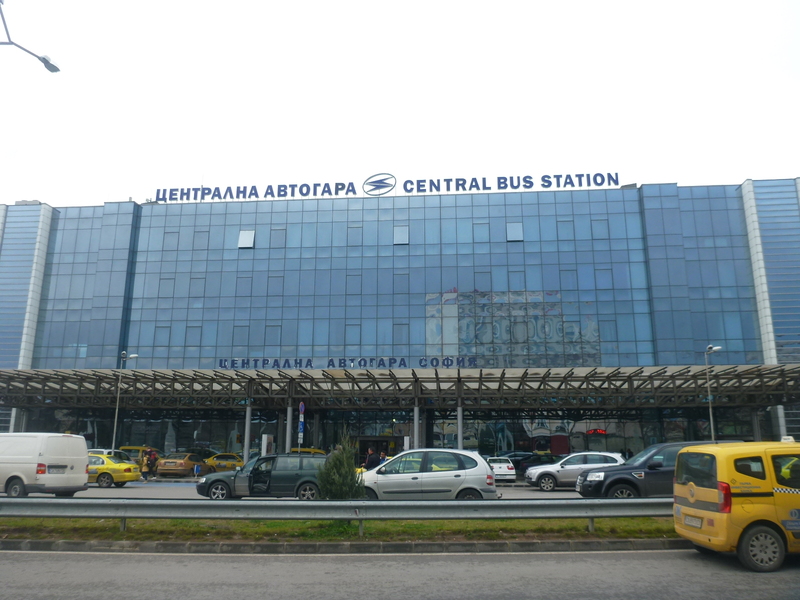 The correct bus station for heading to Skopje Macedonia. 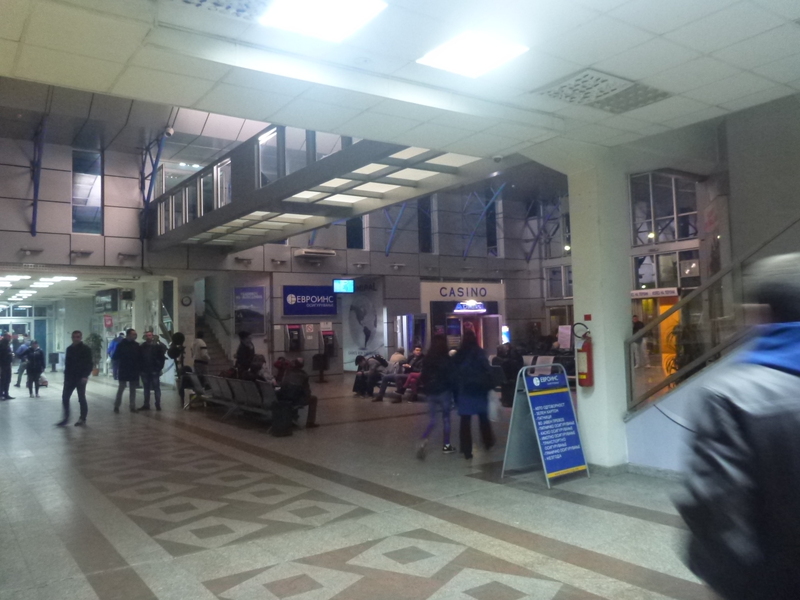 The wrong bus station for heading to Skopje Macedonia. 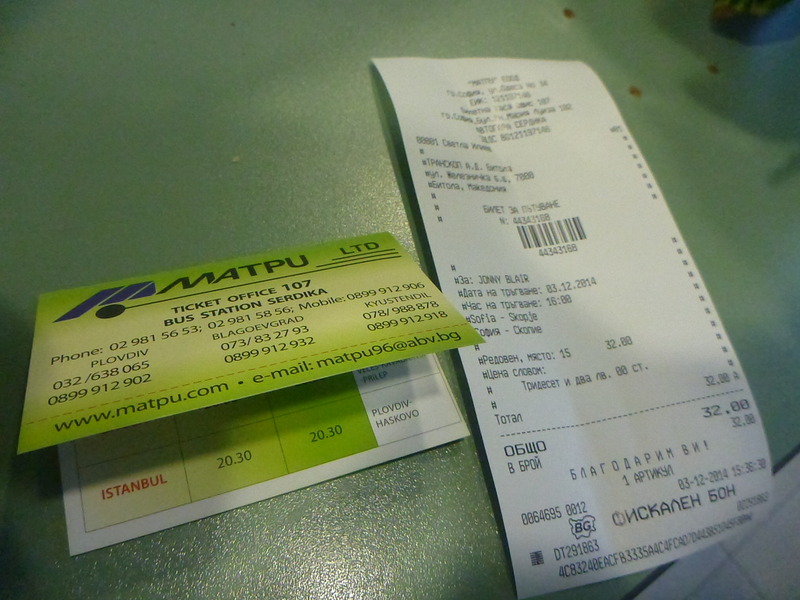 There may be more than one company operating buses from Bulgaria to Macedonia, but the one I used was called Matpu, and I recommend them. In local writing it looks like MATnY. 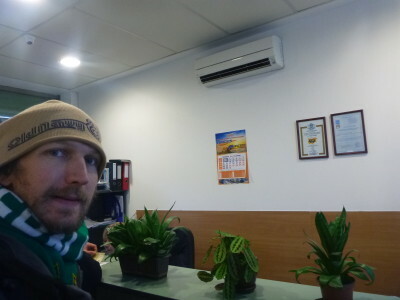 Inside the Matpu ticket office. 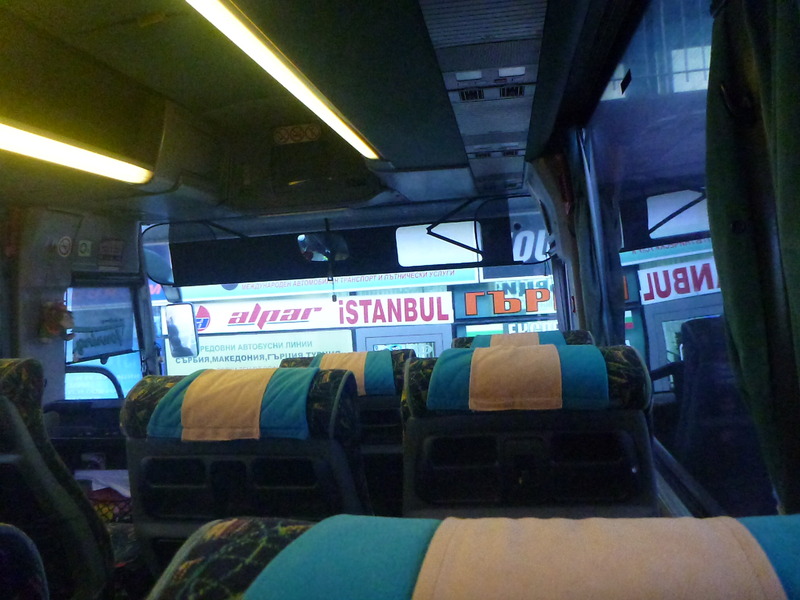 When I went there were 3 buses per day: 9.30 am, 4pm and midnight. 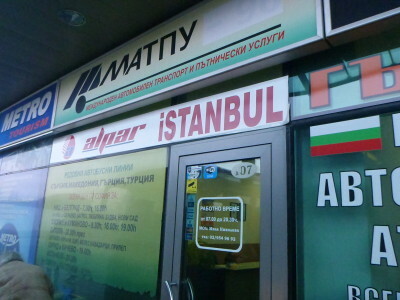 The bus costs 32 Levya (about 16 Euros). 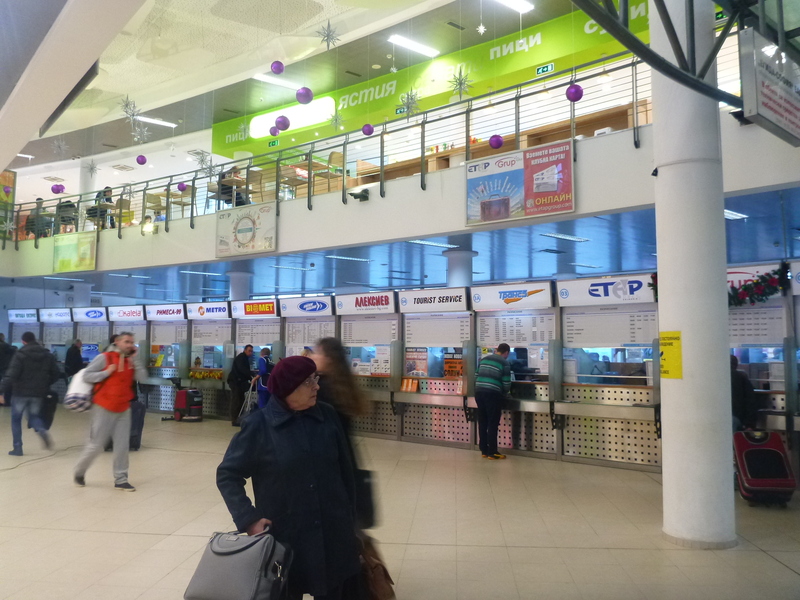 You show your passport and pay for your ticket in cash (Levya only). 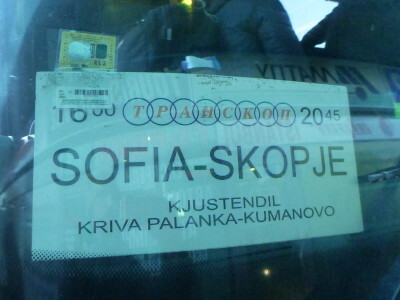 32 Levya for the ticket from Sofia to Skopje. I got my ticket around 3.40 pm. 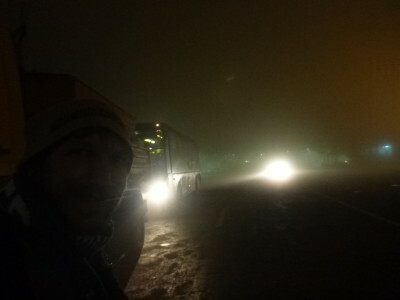 The bus wasn’t full and I was there in December time. It probably will be busier at other times of the year. There was no need to book it in advance for me but if you want to make sure of your ticket, I’d recommend it. I then used up the rest of my Levya buying some beer and snacks for the journey. A final Bulgarian beer for the journey. We left sharply at 4pm and it was still bright. We head west towards the border point at Gyueshevo. The journey towards the border isn’t too memorable – nothing much to see but I got some reading and planning done and enjoyed my beer. 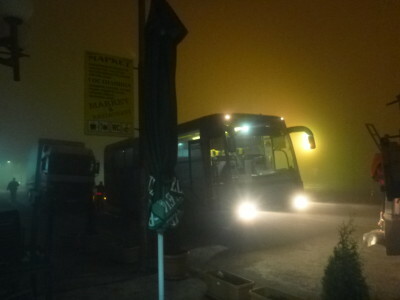 It was dark by the time we got to the border, around 6.30 pm. 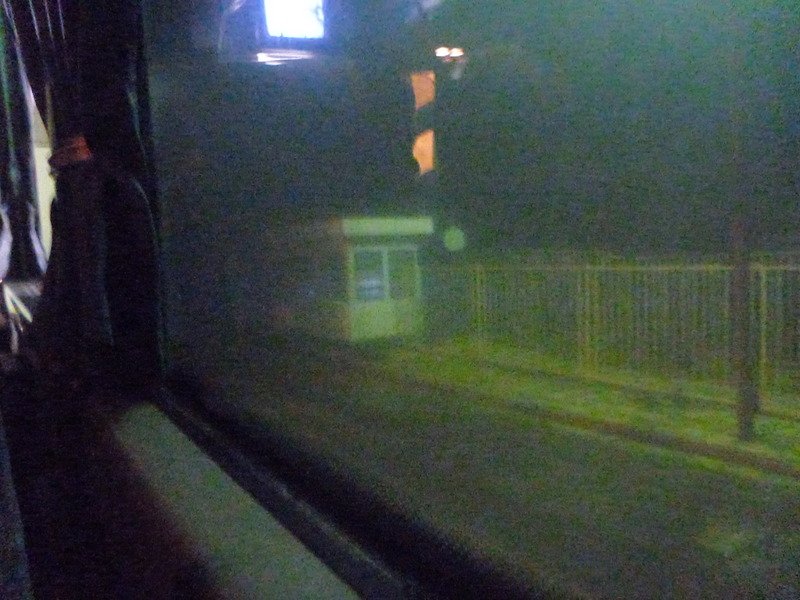 You don’t need to get off the bus to leave Bulgaria. First thing I have to tell you, is that even though it is a dark border, and looks like it should be the same time, it’s not! Macedonia is one hour behind, so move your watches back one hour – you have gained an hour. You get your passport checked on the bus again. EU citizens do not need a visa to visit Macedonia. 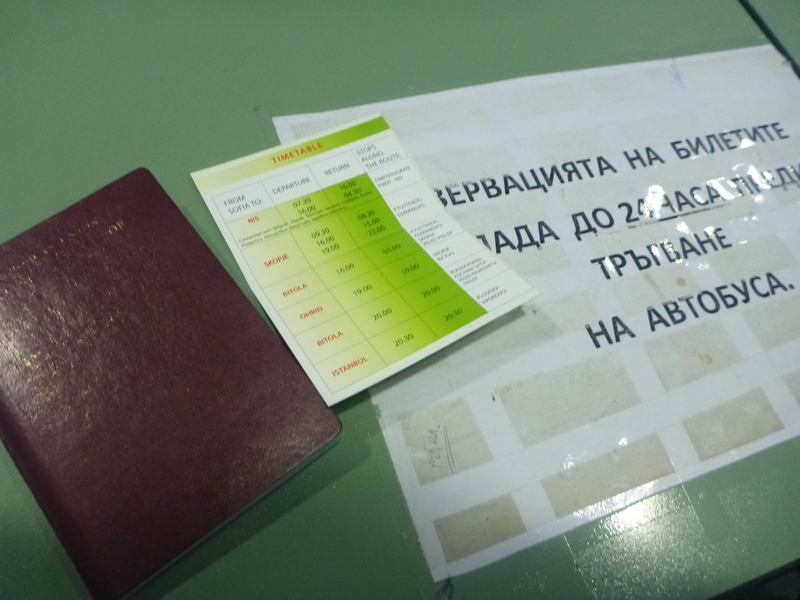 I didn’t get an entry stamp either, but I was now in Macedonia. 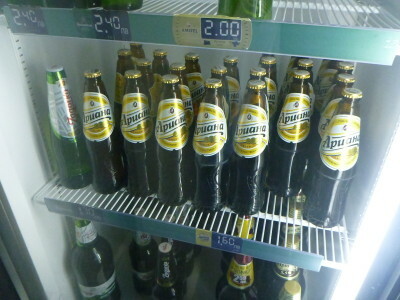 A Macedonian beer for the journey onwards. I then got back on board, enjoyed my Macedonian beer and we were less than a few hours from Skopje, the capital city. We did make another stop on the way where some passengers got off. 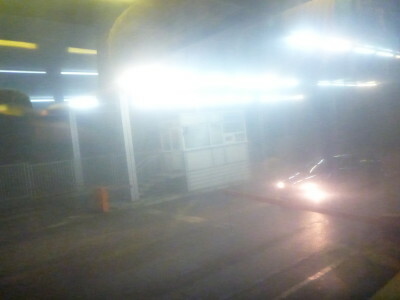 It was dark and I couldn’t work out where it was but probably Kocani or Stip. Enjoying my Macedonian beer on board. 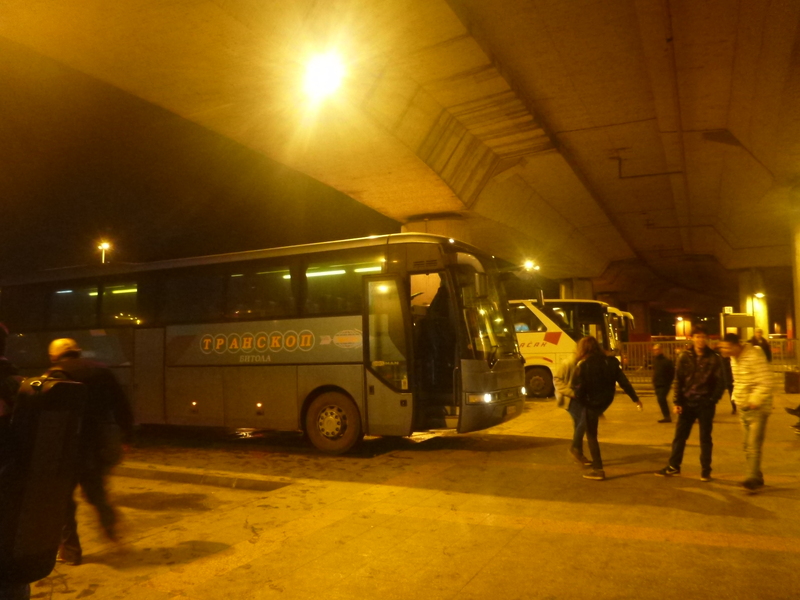 Around 8.10 pm I arrived in Skopje, Macedonia, though it felt later due to the time difference. The entire bus journey took 5 hours 10 minutes, but time wise it only elapsed 4 hours 10 minutes. I headed on foot to my cool hostel – the City Hostel Skopje and was ready to explore a new country and city. I haven’t written much on Macedonia yet but I loved it! 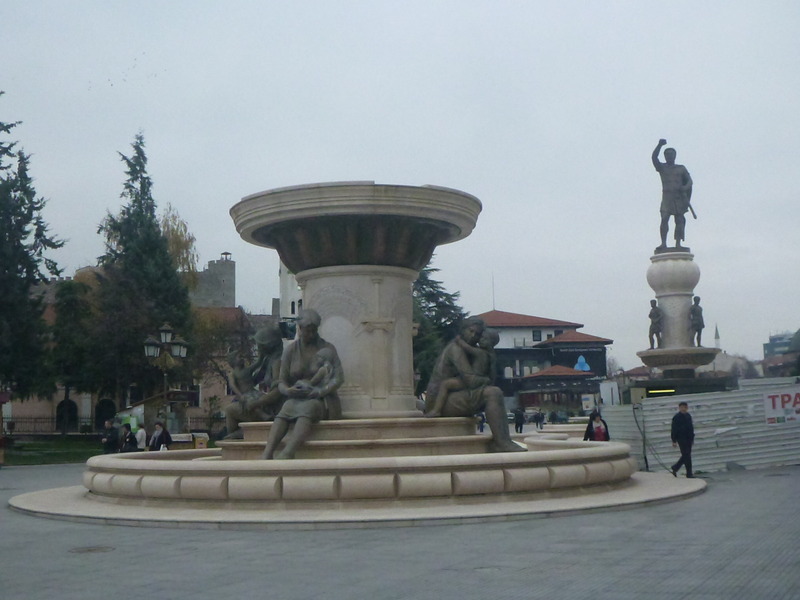 Skopje is a fabulous city, I really recommend it. This entry was posted in Bulgaria, Delcevo, Europe, Gyueshevo, Macedonia, Skopje, Sofia, World Borders. Bookmark the permalink. Hello. Do the buses fill up and is there a way to buy tickets in advance from the US? I am Indonesian student living in Istanbul. I wanna to make a trip from Istanbul to Sofia by bus and from Sofia to Skopje by bus, too. I saw it your post and thanks for helping me figure out the situation. I’d like kindly ask: 1) As long as I have Multiple-Visa Schengen, does it going matter in the immigration office? I mean because I don’t have visa for MKD but I read that I can go to MKD without visa if I have Multiple Valid Schengen Visa. 2) How about the condition overall for the journey from Sofia to Skopje? Thank you for your information. It helps a lot!! I just found out one more choice today. Kaleja runs buses at 00:00 and they start from Central Bus Station. I think Kaleja’s counter is in the Central Bus Station. Hi Jonny. Thanks so much for this! How would you rate the trip safety-wise for a woman travelling alone? I’m not familiar with both countries’ attitude towards women. Any insight you can provide is appreciated. I’m from Malaysia, going to visit your historical beautiful country by October 2016. I’m writing to get information about the bus timetable from Skopje to Sofia, Bulgaria and the fare for 1 way (euro). Thanks for your co operation . how safe are the roads? can people be ambushed at night by bandits? are the roads prone to accidents? do the bus people speak english? were the buses air conditioned? 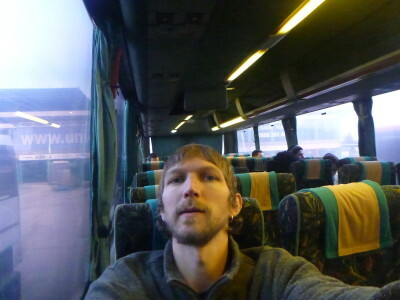 Jonny thanks for all this information, last year in sofia was great to plan our travel to skopje. Thank you! thanks for your info !!!!! Hey man, great blog!! 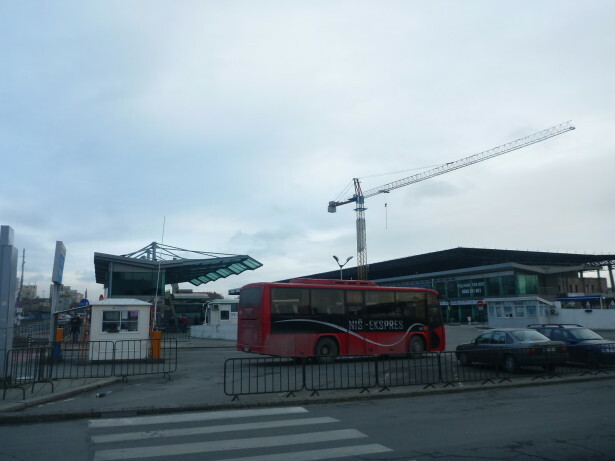 I am doing the opposite and going from Skopje to Sofia… do you remember if the bus station where you got off in Skopje is the main bus terminal?? I am struggling to find this info online… same with Veliko Tarnovo… I am going from there to Bucharest, doing the opposite of what you’ve done! Thank you for the very helpful sharing of information on your trip from Sofia to Skopje. We altogether 9 people will be making the same trip from Sofia to Skopje in August 2017 (Yeah, still sometime away)…I would to ask does the bus equipped with a toilet? 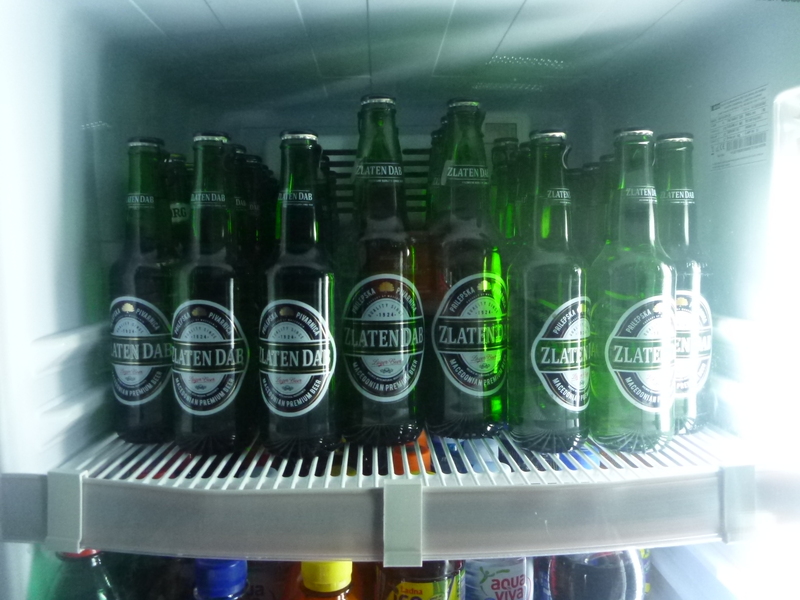 Enjoy Poland…I was there last year…great place to visit. Hi Jonny, great blog. I’m flying to Sofia for a couple days.. how long did the bus trip take you? Reckon a day or two would be worth it? or more? do you have an idea if there any need for visa for Israelis passengers ? i want to go the same route from Sofia to Scopes . 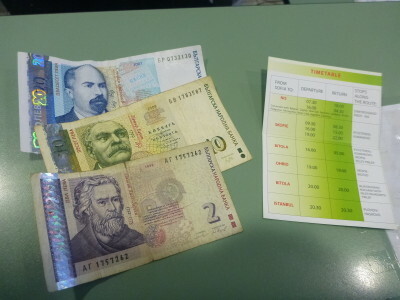 Very useful as due to go via bus from Sofia to Skopje later this month. Thanks. Thanks for all the tips. What is the smoking policy on the bus? Planning to go from Sofia to Skopje on 7th August. Are there any buses at around 5.00 a.m? If so from where and when is it likely to arrive in Skopje? Returning on 9th. What woud you recommend seeing in both Sofia nad Skopje? I am going to the same places in 2 weeks. Finding informations about buses is a nightmare. 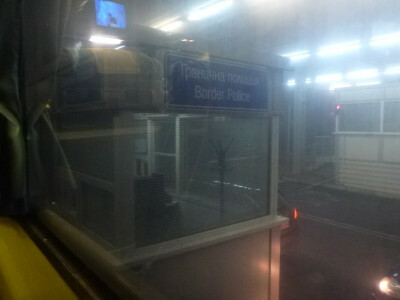 You drink beer before and at the border stop and do not know if there is a toilet on the bus. Hat off to you, my friend in travel. Doing the trip this summer so thanks for the heads up. I have go to admit that I didn’t think about bandits in a EU country or across the border to a wannabe EU member. Was in Bucharest last year and probably the safest city I have visited for a long time. Much safer than any English city of Town or European city popular with the English at 11.30pm on a Saturday night. Everyone have a safe journey this year and enjoy the experiences. SO happy to have found this blog! Thank you! 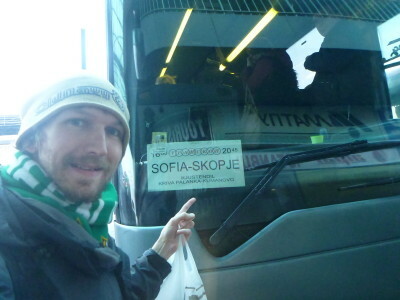 I was having a hard time trying to find a way to get from Sofia to Skopje in May with my family! This helped so much! !